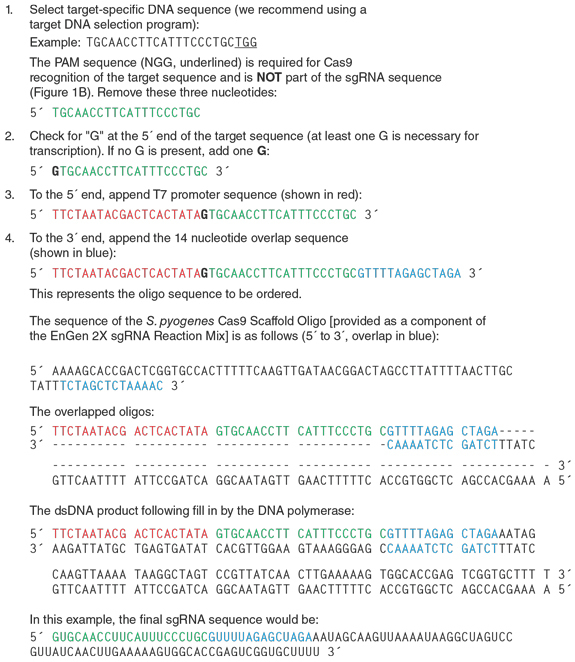 Select 20 nucleotide target sequence (not including the PAM (NGG) sequence). Use of a target DNA selection program is recommended. We recommend Desktop Genetics at www.deskgen.com/landing or ChopChop at chopchop.rc.fas.harvard.edu. Check input sequence for presence of "G" at the 5´ end. If there are no "G's" at the 5´ end, add one "G" (making it a total of at least one G at the 5´ end). We strongly recommend wearing gloves and using nuclease-free tubes and reagents. Reactions should be assembled in microfuge tubes or PCR strip tubes. Thaw EnGen 2X sgRNA Reaction Mix, S. pyogenes, 0.1 M DTT and customer-supplied target-specific oligo (1 µM). Mix and pulse-spin each component in a microfuge prior to use. Store enzyme mix on ice but assemble reaction at room temperature. Mix thoroughly and pulse-spin in a microfuge. Incubate at 37°C for 30 minutes. For DNase treatment bring volume to 50 μl by adding 30 μl of nuclease-free water. Add 2 μl of DNase I (RNase-free, provided), mix and incubate at 37°C for 15 minutes. Proceed with purification of RNA or analysis by gel electrophoresis. NOTE: sgRNAs synthesized using in vitro transcription methods from a DNA template and a bacteriophage polymerase will possess a 5´ triphosphate. Optional: To remove the 5´ triphosphate (leaving a 5´ OH), treatment of the sgRNA with Alkaline Phosphatase, Calf Intestinal (CIP) (NEB #M0290) can be performed. Phenol:chloroform extraction and/or cleanup by spin column is recommended to inactivate and remove the phosphatase. Spin columns will remove proteins, salts and most unincorporated nucleotides. Please ensure that spin columns are compatible with the size of sgRNAs (~100 nts) and expected RNA yields (4–25 µg). Follow manufacturer’s instructions. We recommend Monarch RNA Cleanup Kit (50 μg) (NEB #T2040) for purification . A260 x dilution factor x 40 = "x" µg/ml ssRNA. Expected yields following purification can be 4–25 µg. 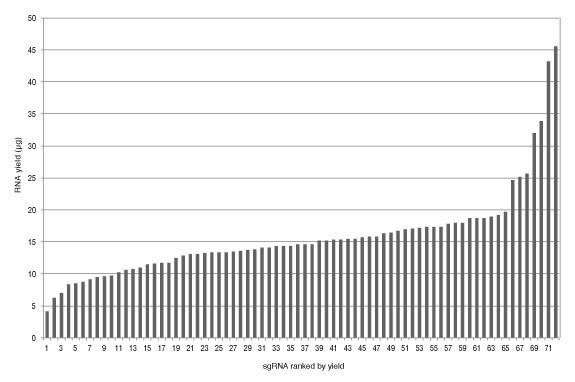 Figure 4: Range of sgRNA yield from the EnGen sgRNA Synthesis Kit, S. pyogenes. 72 different target-specific oligos were designed and tested for RNA yield following DNaseI treatment and column purification as determined by NanoDrop. RNA yields may be dependent on specific oligo sequence, with most falling between 4–25 µg. Assessment of sgRNA quality and length can be evaluated by gel electrophoresis. Gels should be run under denaturing conditions to avoid formation of secondary structure. Mix an aliquot of RNA with RNA Loading Dye, (2X) (NEB #B0363) or Urea Dye. Denature RNA according to manufacturer’s recommendation and load onto a TBE-urea gel, such as Novex® TBE-urea gels. Visualize RNA by staining the gel with SYBR® Gold or ethidium bromide. Figure 5: Examples of sgRNAs synthesized using the EnGen sgRNA Synthesis Kit, S. pyogenes and multiple different target-specific oligos including the EnGen sgRNA Control Oligo, S. pyogenes. S. pyogenes Cas9 double-stranded DNA nuclease is guided to the target DNA based on sequence complementarity to the sgRNA that is loaded into the protein. Site-specific DNA cleavage occurs three nucleotides upstream of the PAM sequence (NGG), within the complementary region. sgRNAs synthesized with this kit can be used with Cas9 nuclease, S. pyogenes (NEB #M0386) or EnGen Spy Cas9,NLS (NEB #M0646) for in vitro cleavage reactions. 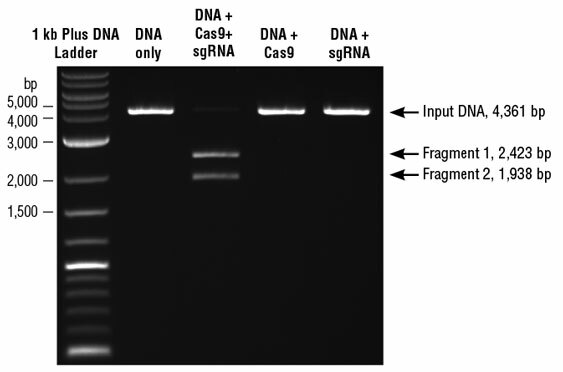 Figure 6: Example of an in vitro Cas9 nuclease assay. DNA target is PvuII-linearized pBR322, sgRNA was synthesized using the EnGen sgRNA Control Oligo, S. pyogenes. Reactions were set up following NEB® protocols with a ratio of 20:20:1 (Cas9:sgRNA:target site) in 30 µl reactions. Aliquots of reactions were mixed with Gel Loading Dye, Purple (6X) (NEB #B7024). 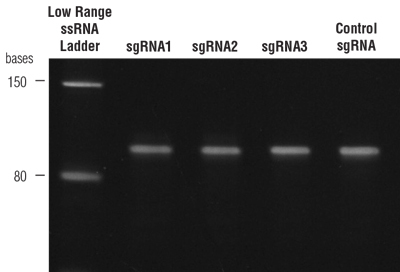 Cleavage products and 1 kb Plus DNA Ladder (NEB #N3200) were resolved on a 1% TBE agarose gel stained with ethidium bromide.